Mobile computing and telecommunications have been the most sought-after technological advancements ever since the microprocessor was invented, and we've come a long way since the Osbourne 1 and the Motorola DynaTAC were launched on the market (HINT: decades ago). Ever since, technology has moved forward at a dazzling pace and the mobile market is one of the best examples where new tech is being promoted and implemented on a yearly basis. Will this expansion ever stop? How much better can mobile computing get before it's going to reach a dead end? Well, I can’t answer that, but what I do know is that, at this point in time, there's a strong emphasis on "augmented reality," and this seems to be the direction in which mobile computing is heading right now. This leads us to one gadget in particular, one that hasn't yet seen the light of day but should become available for purchase in the near(ish) future. I'm talking, of course, about "Google Glass". Assuming that you're not familiar with this particular gadget, Google Glass is basically a pair of glasses (hence the name) that features a small heads-up display, a 720p camera, a microphone as well as an earpiece, and the headset is meant to be the next big step into hands-free communications. 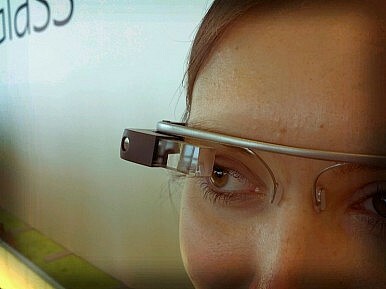 Although the entire range of hardware specs has not been revealed yet, what we've learned so far is that Google Glass will be connected to the internet and will allow its users to capture and share photos and videos, get navigation information and search the web on-the-go. It all looks and sounds quite interesting and "Sci-Fi," but it doesn't mean that Google Glass will take over the mobile market and replace the smartphone as a concept. The reason for that is because, while the idea behind Google Glass is an interesting one to say the least, reports from CNET indicate that the gadget actually needs a smartphone in order to function as intended. To be more precise, this futuristic pair of glasses needs to be connected to a smartphone via Bluetooth, and as such, it will utilize the handset's capabilities of connecting to Wi-Fi/ 3G and/or 4G in order to gain access to the web. According to The Verge, Google Glass will be available in five colors (gray, orange, black, white, and light blue) and Google also plans on shipping an Explorer Edition that will come with a sun-glass accessory capable of easily twisting on and off. It has also been rumored that Google has approached Warby Parker, a company that sells fashionable eye glasses, which means that the Mountain View-based company is interested in making Google Glass' design a bit more "trendy". What About The Price Tag ? With all the above in mind, probably the biggest question that needs to be answered before reaching a conclusion regarding the gadget's success is whether or not the price tag will be accessible. Unfortunately, the price-range hasn't been revealed thus far, but Google has offered those who attended Google I/O 2012 the opportunity to buy a developer model at the price of $1,500, which might seem a bit excessive. However, the latest reports claim that once the gadget will (or should) go on sale later this year, the final price will be lower than that, albeit we're still not sure by how much. The bottom line is that Google Glass seems like a very interesting piece of technology, but we can't predict whether or not it will be viewed just as a glorified, overpriced (and perhaps even silly for some) Bluetooth headset, or if it will represent another large innovation in next-gen mobile tech. It might open the gates to an entirely fresh generation of devices, or it might not. We'll have to wait and see how the story develops, but in the meantime feel free to share your thoughts on the matter by leaving a comment below. Google Glass: Promise and ControversyGreen Shoots Sighted for Asia’s EconomiesAn Oil Discovery Before Systemic Reform in Pakistan Would Be a TragedyIn Myanmar, Jittery Investors Threaten Long-Term DevelopmentAsia’s Elections: Market Moving or More of the Same?